Just 50 years ago, we could not have taken a hike to enjoy the Indiana countryside and been fortunate enough to encounter the now familiar white-tailed deer bounding across a cornfield or disappearing into a woodlot. By the 1930s, the whitetail, an abundant species when the settlers arrived in the early 1800s, had been pushed to extinction in Indiana. Now, the Hoosier state can boast of a healthy and productive herd. Our pride in this herd is well-founded, because it is a symbol of the success of our wildlife management and conservation efforts. In 1934, the Division of Fish and Game (parent agency to the present Division of Fish and Wildlife) began restocking with about 400 deer which were trapped and transferred from Wisconsin, Michigan, Pennsylvania and North Carolina. Nearly all releases were made on state and federal properties of the southern hills. Deer immigrating from Michigan helped rebuild the herd in northern Indiana counties. Animals moving up and down the major drainage systems began dispersing throughout central Indiana. Biologists accelerated the dispersal by trapping deer from public lands and moving them to counties with few or no deer. In conjunction with wildlife biologists’ dedication to re-establishing deer, conservation officers worked around the clock to protect the new herds. Our restoration efforts have been generously rewarded. Today, deer inhabit every county in Indiana and provide recreation and enjoyment to all types of outdoor enthusiasts. White-tailed deer are Indiana’s sole representative of the family Cervidae, which includes mule deer, elk and moose. The best known characteristics of this family is that males bear antlers. Antlers, unlike horns, are not permanent structures. Male cervids develop and shed antlers annually as part of their reproductive cycle. Whitetail antler development begins in mid-March to April and continues through August or September. The growing bone is covered with a hairy skin called velvet which dries up and begins to slough off as the antler hardens. By rubbing the antlers on saplings, bucks speed up the loss of velvet and polish their new racks. The antlers are shed in January or February, after breeding season. The number of points on a buck’s rack is not an indication of age. A combination of factors, including age, nutrition and genetics affect antler development. During spring and summer, adult whitetails have a sleek reddish-brown coat. A newborn’s coat is patterned with white spots, which help the fawn to blend with its surroundings. In August and September, the summer coat is shed; the fawn loses its spots and prepares for winter along with adult deer. The brownish-gray winter coat is thick and helps insulated the deer through the winter. Deer are in their prime at three to six years of age. They may live to 20 years or more in captivity, but in the wild, a whitetail that lives to age 10 is considered old. Weights vary considerably, but an average adult male weighs 175 pounds while a female weighs about 120 pounds. Deer are creatures of habit and generally occupy a home range of one to two square miles. Have you ever watched a bounding deer and been amazed at its ability to move gracefully and quickly through even the densest cover, as if it knew the exact location of each break in vegetation? Maintaining a relatively small home range, the deer becomes intimately familiar with its surroundings- a good strategy for survival in the wild. The whitetail breeding season occurs in October and November. Does may breed at six to seven months of age but generally breed for the first time when 1 1/2 years old. Bucks are physiologically ready to breed at 1 1/2 years of age but may not have the opportunity for several years because older bucks dominate the does. Dominate bucks will mate with several does during a single season and will chase off younger bucks that attempt to breed. Fawns are born in late May or early June after 200-day gestation period. A doe in good condition will generally produce two fawns. At birth, fawns weigh only four to eightpounds; however they grow rapidly, doubling their weight in just two weeks. Fawns have little scent, an adaptation to help prevent predators from finding the defenseless infants. Instinctively, they lie motionless when danger approaches. If you find a hidden fawn, never move it or assume that it is an orphan. Rest assured, its mother is nearby, and fawns will usually travel with their mother through their first winter. Whitetails are extremely adaptable in their food habits. Deer consume primarily wild herbs, fruits and agricultural crops when available; however, they can survive on the leaves, buds and twigs of woody trees and shrubs when other foods are scarce. When abundant, acorns are the mainstay of the fall and winter diet. In localized areas of Indiana, deer crop damage, particularly corn and soybeans, is a problem. Farmers with damage problems are encouraged to work with their district wildlife biologist to develop strategies to alleviate damage. 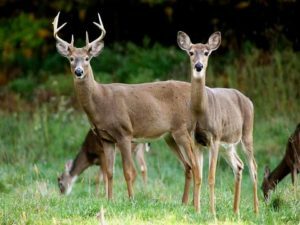 Fencing, chemical repellents and noise devices may provide relief in some situations; however, the most effective and efficient deer damage control technique is carefully regulated hunting. The number of deer in Indiana has increased steadily since their reintroduction in the 1930s. Until 1991, concerns about deer vehicle collisions and crop damage by deer led to the division to begin lowering the deer population in selected counties in the 1980s. By 1992, the statewide deer population began to decrease in response to increased harvest of antlerless deer. Uncontrolled growth of our herd would be disastrous for both the deer and the people of Indiana. Damage to agricultural and forest crops would become economically unbearable. The depletion of the habitat would be reflected in smaller, less-healthy deer. Closely regulated harvest of female deer is needed to stabilize the population growth in some areas of the state. In addition to being a valuable management tool, deer hunting provides recreation to nearly 200,000 Hoosier sportsman each year. Hunting and other outdoor recreation are primary industries in our scenic counties and are an important part of that picture.